Amazon.com description: Product Description: Are the limitations imposed on World Trade Organization (WTO) members' right to regulate efficient? This is a question that is only scarcely, if ever, analysed in existing literature. Boris Rigod aims to provide an answer to this fundamental concern. Using the tools of economic analysis and in particular the concept of economic efficiency as a benchmark, the author states that domestic regulatory measures should only be subject to scrutiny by WTO bodies when they cause negative international externalities through terms of trade manipulations. He then suggests that WTO law, applied by the WTO judiciary can prevent WTO members from attaining optimal levels of regulation. 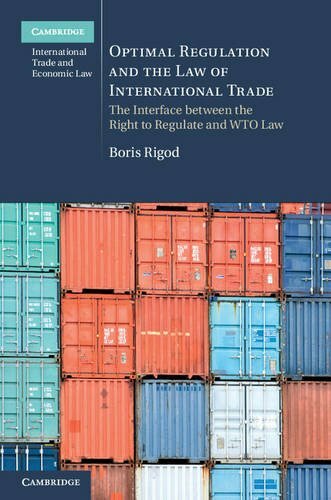 By applying a law and economics methodology, Rigod provides an innovative solution to the problem of how to reconcile members' regulatory autonomy and WTO rules as well as offering a novel analytical framework for assessing domestic regulations in the light of WTO law. About: Are the limitations imposed on World Trade Organization (WTO) members' right to regulate efficient?